Its safe to say that along with Gopal Prashad Rimal ,Bhupi Serchan (1936-1939) is one of the greatest on mere recent Nepali Poetry.Like Rimal's,his poems have a marked effect on the language and philosophical attitude of most of the Nepali verse published after 1970 .Although he was the son of a wealthy Thakali from Tukucha vilage to the north of Pokhara, Serchan quickly turned to communism . Most of the poems of Serchan haspoliticalinfluence. 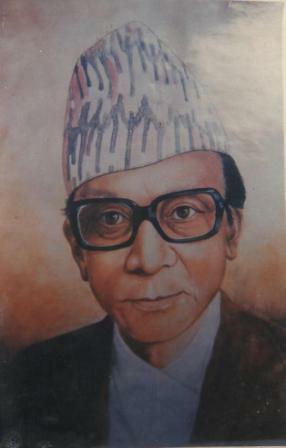 In 1969 a collection of 42 poems named 'Ghumne Mech Mathi Andho Manchhe ' which became the most influential collection of Nepali verse since since Devkpta's 'Muna Madan' and Rimal's 'AmakoSapana' .
.(Khanal 1977:268)- Serchan's poems are sadonic ,angry satrical and whimsical by turns and are greatly loved .In matters of language he is ultimately utilitarian , employing well- established English loans sparingly bu withoutcompunctionwhen necessary. Prat : Ek Agyat is a near reflection on the ageing process , which is compared to the diary squeezing out of the toothpaste from a tube. theloam- word toothpaste is the final line used in joke.but also demonstrate that Serchan's poems were addressed primarily to an urban readership. he poem 'Yo hallai hallako desh ho' (1967) is a long cry ofpatrioticage against the corruption and lack of intellect , Serchan considered his country's most crippling weakness .Again the use of English such as 'earphone' 'truck', 'plasters' and so on is partly utilitarian -Nepali does notpassesequivalents for these words and poetry.